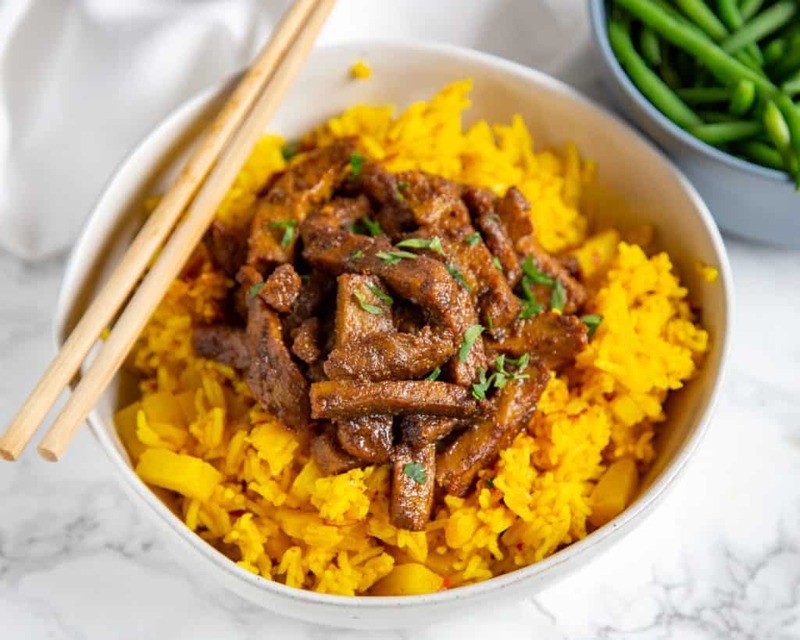 This easy vegan dinner features strips of seitan in a rich, flavorful curry sauce with sweet and spicy pineapple rice. I love the flavor of curry powder. It combines many of my favorite herbs and spices – cumin, turmeric, cinnamon, garlic, ginger, to name a few – to bring unique flavor and color to any dish. Even though I cook with curry all the time, I never combined it with seitan until I ran out of my favorite jerk spice blend. Now, this curry seitan is my favorite vegan dish. Combine it with curried pineapple rice and you have the perfect easy weeknight dinner! Seitan (pronounced SAY-tan) a high-protein low-carb meat substitute that was developed centuries ago by vegetarian Buddhist monks. It’s popular for it’s “meaty” texture (at least compared to tofu and tempeh) and works well in many dishes. It has a mild flavor on its own, so works well with many other flavors in dishes. I love it with curry, barbecue sauce, and even as a beef substitute in stroganoff. You can find it in the refrigerated section of most grocery stores, generally near tofu and other natural foods. Start with the pineapple rice. Mix together basmati rice, canned pineapple with pineapple juice, water, curry powder, red pepper flakes, and salt in a medium saucepan. Cover and cook over medium heat for 20 to 25 minutes until the rice is tender. Then start on the curry sauce by heating a medium nonstick skillet over medium heat. Add vegetable oil. When the oil is hot, add the curry powder and red pepper flakes. Cook for about 4 minutes stirring constantly until the spices are fragrant. Take the skillet off the heat and stir in the soy sauce and brown sugar. Pour the curry sauce into a bowl. Place the skillet back on the heat and add more vegetable oil. Then add the seitan and cook for a few minutes until the seitan is heated through. Remove from the heat, add the curry sauce, and mix together. Serve the curry seitan over the pineapple rice. Looking for more vegetarian recipes? Try this Vietnamese noodle bowl, tofu tikka masala or tofu bibimbap. Or for more curry recipes, try this Thai shrimp curry or curry Singapore noodles. 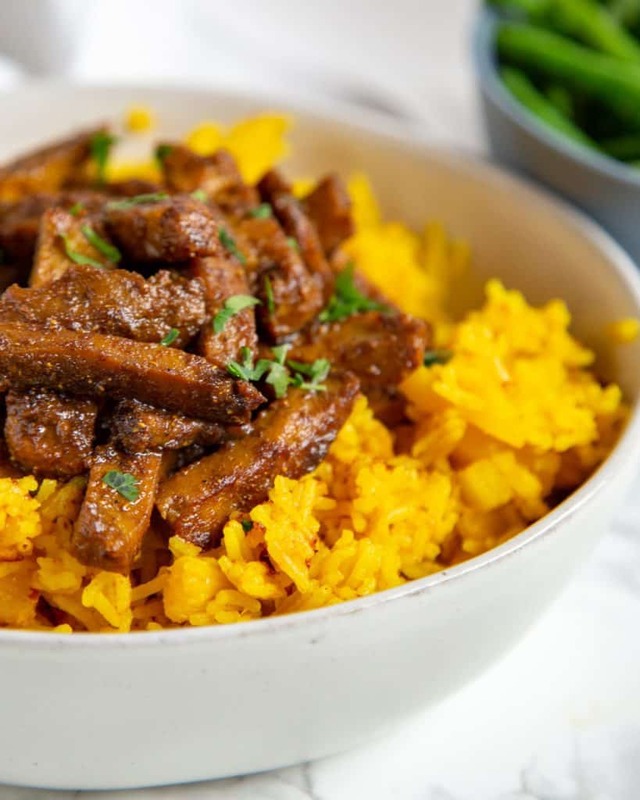 If you try this recipe for curry seitan with pineapple rice, leave a comment and review below and let me know how it worked out for you! In a medium saucepan with a lid combine the rice, pineapple (including all of the pineapple juice), and water. Add in the curry powder, salt, and red pepper flakes and stir. Cover and cook over medium heat for 20 to 25 minutes, stirring occasionally, until the rice is tender. While the rice is cooking, heat a medium nonstick skillet over medium heat. Add the vegetable oil, then add the curry powder and red pepper flakes. Cook for about 4 minutes stirring constantly until the spices are fragrant. Then remove the skillet from the heat and add the soy sauce and brown sugar. Pour the sauce into a bowl and place the skillet back on the heat. Add the remaining tablespoon of vegetable oil. Then add the seitan and cook for about 4-5 minutes until heated through. Remove from the heat and pour the curry sauce in with the seitan. Mix through until the seitan is coated by the curry sauce. 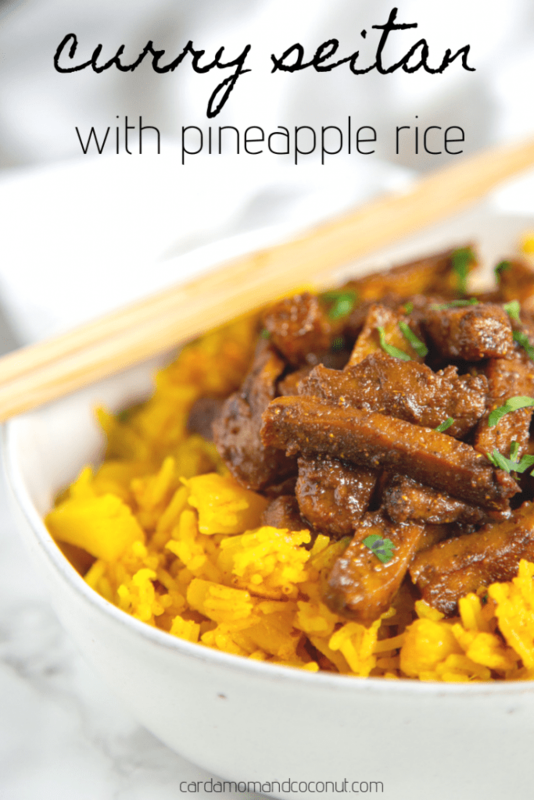 Serve the curry seitan with the pineapple rice. 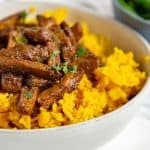 Oh yum, I’d never heard of seitan before but it sounds delish, especially paired up with sweet and spicy curry! I’ve never tried pineapple rice, but that sounds like such a great combo! I definitely need to give seitan a try! This looks like such a delicious dish and I love pineapple rice! These look like they have been cooked to perfection! Gorgeous shots too!